Suspended Impurities:- These are the physical impurities which remain suspended in water such as dust, sand, dead insects and harmful micro-organisms like bacteria, viruses and cyst. They lead to discoloration of water and may also cause diseases. Dissolved Impurities:- These are the chemical impurities which get dissolved and mixed with water. They cannot be removed by simple filtration techniques and require advance technology for removal. These impuritiesinclude chemicals, rust, pesticides, insecticides and salts of metals like arsenic, fluoride, iron, calcium etc. This is the most common and widespread form of purification technology available to us. Boiling effectively kills all harmful micro-organisms but has no effect on other suspended impurities like dust, sand, etc. It is also not able to remove dissolved impurities present in the water. The logic being simple- if you boil water containing sugar or salt, the water will still remain sweet or salty. Ultra Violet (UV) Disinfection has been in the market for many years now. Some people also refer to this technology as electronic boiling. This technology successfully deactivates harmful micro-organisms like bacteria and viruses but fails to properly deactivate the more harmful ones - cysts. Also, if the water purified through this technology is stored for a long time, then there are chances that the deactivated micro-organisms may reactivate again. When used in combination with other filters (sediment and carbon), this technology is quite effective in removing all suspended impurities as well as some of the dissolved gases in water. But similar to Boiling, this technology has no effect on dissolved impurities such as rust, arsenic, fluoride, etc. RO technology is probably the best known purification technology to the mankind. It effectively removes all harmful micro-organisms such as bacteria, viruses and cyst. When it is used in combination with other filters (sediment and carbon), it successfully removes all other suspended impurities from water including dissolved gases and organic impurities. The biggest advantage of this technology is that it is able to remove more than 99% of dissolved impuritiessuch as chemicals, rusts, salts of heavy metals, pesticides andinsecticides present in water. Infact, RO is the only affordable technology to be able to remove dissolved impurities from water. The process is so efficient that all the dissolved salts (minerals) from the drinking water are filtered out including the essential ones necessary for our body. Water purified through only RO technology is distilled, has a bitter taste (because of no essential minerals) and has pH value lower than 7 which makes it slightly acidic. Further, RO technology uses a very fine membrane which has a pore size of 0.0001 micron. The process requires raw water to be forced at a very high pressure so that waterpasses through the small pores of the membrane, which blocks the bacteria, germs and other impuritiesfrom passing through. However due to variation in day and night temperatures and high speed pressure, some of the pores of the membraneget enlarged after few months of continuous use, allowing harmful micro-organisms to easily pass through it, thereby making the process ineffective in the long run. Keeping in mind the disadvantages of RO technology, Kent has invented a new technology called the Mineral RO™ Technology. This patented technology has all the benefits of the RO technology, while eliminating its limitations. 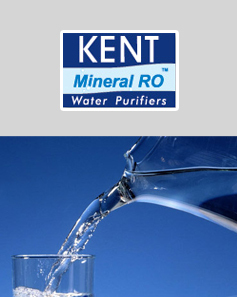 Kent’s patented Mineral RO™ Technology uses an innovative TDS (total dissolved solids) control valve which allows the user to control the amount of essential natural minerals present in drinking water. It ensures that the RO purified water does not have a bitter taste and the pHis maintained around 7. It also enables the user to adjust the amount of TDS in purified water according to one’s taste. This technology is based on double purification wherein water after passing through RO, is also passed through Ultra Violet (UV) radiation and Ultra Filtration (UF). Secondary purification by UV/UF ensures that when the pores of RO membrane open up and allow harmful micro-organisms to pass through, they getdeactivated/filtered out by UV/UF.